Fiction – paperback; Granta; 180 pages; 2015. Expectations are funny things, aren’t they? When you pick up a book and start reading, your expectations can do so much to your enjoyment of the reading experience: too low and you can be pleasantly surprised; too high and you’re disappointed. Sometimes you can have no expectations at all and be completely wowed. 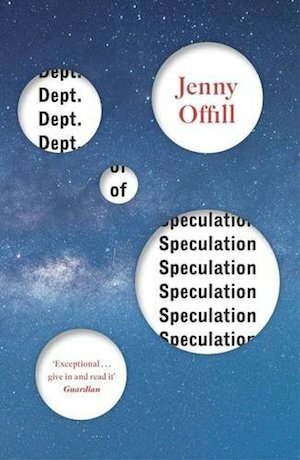 With Jenny Offill’s Dept of Speculation, a book I’d heard so many great things about (mainly via Twitter), it was a case of super high expectations not being met. It’s not that I didn’t like the book, because I liked it a great deal, but I couldn’t help thinking, is that it? Why is everyone raving about this? First up, the good points. The novel has an interesting and unusual structure. It comprises fragments, written mainly in the first person and occasionally in the third, which chart one woman’s experience moving from romance to marriage to parenthood to possible divorce. In isolation, these individual snippets don’t mean much, but taken as a whole they add up to a rather effective, if slightly predictable, story spanning about seven years. It’s a rather wonderful portrait of a marriage, though we only ever hear one side of the story. Interestingly, for much of the novel the narrator describes herself as “the wife”, and it becomes clear as her married life progresses that her identity is so caught up in the idea of marital harmony that when it begins to go wrong, when it starts to unravel, she’s at a loss as to what to do. Yet the signs had been there all along. When we met, he wore glasses he’d had for fifteen years. I had the same bangs I did in college. I used to plot to break those glasses secretly, but I never told him how much I hated them until the day he came home with new ones. My sister shakes her head at this story. “You have a kid-glove marriage,” she says. Dept of Speculation is also a fascinating look at parenthood, especially the changes that arise with the arrival of the first child. Offill depicts those early months as a parent with great insight and honesty: here is a new mother, her life forever changed, grappling with sleep deprivation and a baby that won’t stop crying while her husband goes off to work and leaves her to cope alone each day. What did you do today, you’d say when you got home from work, and I’d try my best to craft an anecdote for you out of nothing. The book is also very good at mood. There’s a lot of anger in it (and a little bit of wry humour), though the overriding emotions are sadness and despair: the narrator never seems happy or content with her lot and even when her marriage is on a sure footing she doesn’t quite believe it’s ever going to last. And now you’re wondering about the bad points, right? For me it was the narrative composed entirely of fragments. Yes, I know I’ve already suggested the structure was one of the positives, but overall the fragments felt too elusive, too fleeting, too brief, too much like Tweets (I’m sure most of them were no longer than 140 characters) or Facebook posts, so that I raced through the book in two hours without properly taking in the detail. Perhaps it’s unfair to blame the author for this; I should have simply slowed down and savoured each snippet, yet the structure didn’t particularly lend itself to a careful reading. In some ways it felt like a book for the internet age, for people with short attention spans. And the story, while told in an original way, felt self-indulgent and too focused on the navel; and the tone was simply too petulant and whiney for me. I know that you don’t have to like a character to like a book, but I think you do need to like the voice and I really didn’t like this one. I felt exactly the same way as you about this book. I liked it, but couldn’t figure out why people were raving. I felt like I must have been missing something, but I think it must just be a combination of personal tastes and high expectations. I wondered if perhaps you had to be a mother to totally “get” it… but obviously not. I am still curious about this book, but I think I will let it sit for a while longer. Maybe by next year, when people aren’t raving about this so much anymore, I will give it a try. As you say, it is always a bit disappointing when high expectations aren’t met, even if the expectations might be a bit too high. It’s worth reading, but yes, don’t open it with high expectations, you may well love it. I’ve got this. Expectations now lowered…. Btw, I noticed it’s only 180 pages – written in these “fragments”, you must’ve whizzed through it, yes? Yes, it’s a quick read — as I point out in my review I read it in about two hours. But it did leave me feeling rather odd and a tad grumpy. I had to go on a long 6-mile walk to shake off that feeling of gloom it left me with. This is what I call a model review for a book you didn’t much like. Fair, honest, and enjoyable to read! Thanks, Lisa. I find it difficult to slag off books I didn’t like because I know there’s a real person behind the book and they’ve most likely devoted a huge chunk of time and energy towards crafting it. They don’t need me — an untrained reviewer with not even a literature degree to fall back on — saying horrible things about their work. That doesn’t mean I won’t be honest, but I do always try to be fair. I love the structure of your review. This book is on my pile – and I’m more intrigued now ironically! I always find that negative reviews make me want to read the book, which is why it annoys me when some people only ever write positive ones! Very good job reviewing this book fairly. Like you, I was rather disappointed. It was well written and full of moments of enlightenment, but it felt more like a book of vignettes or poems to me than a coherent structure and story. There was something that made me think: ‘So what?’ at the end of it. Not that I need a big fat QED at the end of every book, but this one felt like a book of excellent parts rather than a whole. Thanks, Marina. I’m glad to hear that I’m not the only one who didn’t quite love this book. Thanks Jacqui… I guess I just didn’t understand what all the fuss was about… and a few weeks after reading this book I can remember very little about it other than the kind of woe-is-me mood that pervades it.